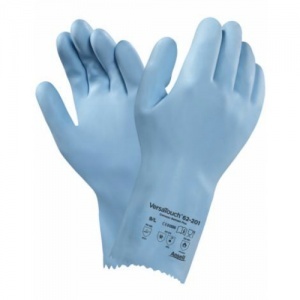 The Ansell VersaTouch 62-201 Supported Latex Gauntlet Gloves are flexible natural rubber latex gloves with a seamless nylon liner for enhanced comfort. Safe for use with food and providing good chemical, mechanical and heat protection, the 62-201 Latex Gloves are suitable for a wide range of applications in food and cleaning services. The 62-201 Gloves provide protection against contact heat. When tested to EN407:2004, they received a rating of 'X1XXX', meaning that they provide protection against contact heat up to 100°C. The Ansell VersaTouch 62-201 Gauntlet Gloves are available in a choice of sizes, making them suitable for most users. Please consult the table below for details, then select the required size from the drop-down menu at the top of the page. The gauntlet gloves have a thickness of 1.2mm and a length of 300mm.